Thrustmaster Mechanical Fuse on Z-drives PDF Article – For more than 30 years, Thrustmaster has been building brown water propulsion equipment to excel in even the harshest operating environments. 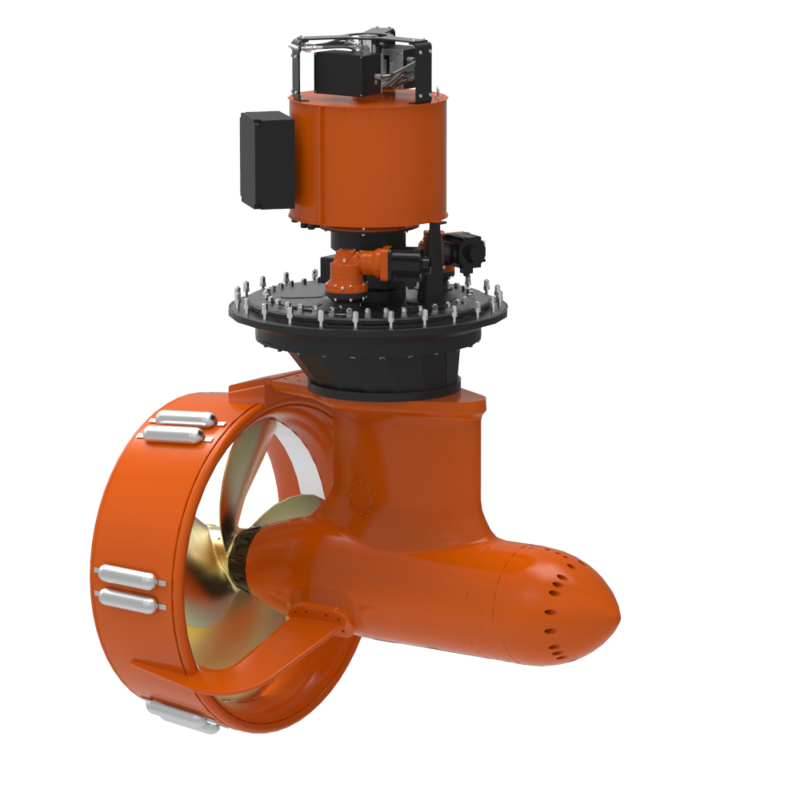 As a highlight of Thrustmaster’s efforts to safeguard our products and exceed expectations in the most demanding conditions, our American-made Z-Drive thrusters for towboats operating in the inland waterways, are the first thrusters in the industry to include a built-in mechanical fuse or quick release coupling. The incorporation of a quick release coupling at the input shaft of the Z-drive gives operators the added protection from the inevitable debris that can line the riverbed. 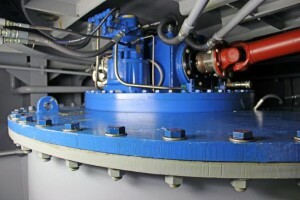 The quick release coupling acts as a mechanical fuse whenever the drive line is blocked, for example should the propeller ingest a log, a tire or other river waste that is typical during daily operations. After the obstruction is removed from the propeller, the mechanical fuse can quickly be reset manually. The mechanical fuse, also called a torque limiting coupling, is a component installed on the horizontal input shaft of the Z-drive and connects to the cardan shaft driven off of the engine or electric motor. The concept behind the quick release coupling is that when the propeller or gear set and/or drive line sees any spike in torque above the set limit for the coupling, then the coupling instantaneously breaks free allowing the cardan shaft and engine to spin freely without driving the thruster. The propeller and gear set are instantaneously disconnected from the engine saving the propeller, gear sets, and bearings, from damage or complete failure. Therefore, not only avoiding the damage, but also operational downtime, unnecessary dry-docking, and crippling cost of repairs typically associated with the competitions’ thruster run-ins with the inevitable debris. The quick release coupling is a standard component on Thrustmaster’s line of Z drives and sets Thrustmaster’s series of inland water Z-drives apart from the competition. Thrustmaster Z-drives are designed based on conservative American standards observing ample safety margins. Thrustmaster has built a reputation on designing and manufacturing each Z-drive with a stalwart stainless steel propeller turning in a Kort nozzle with all stainless steel internals. Bolstering the thruster design by fully welding the nozzle to the lower housing for added strength, reducing vibration, and insuring the nozzle is not lost in grounding. Much praise has been given to the generous sizing of the gears, transmission shafts, and precision bearings. For the trying and difficult conditions of brown water, Thrustmaster is striving to increase vessel uptime through superior products.